We are Our Handmade Collective, an award winning, handmade, handpicked gift shopping experience located in the Grand Arcade, Leeds city centre. We stock the work of more than 70 local Makers, with high quality handmade products that you won’t find on the mainstream High Street. We like to stand out from the crowd and pride ourselves that you can find the perfect gift for all occasions! Run by two friends, Claire and Natalie, who are Little Shop of Lathers and Handmade by Natalie respectively, we began life in June 2013. We are winners of Leeds Love Affair Best Place to Shop in Leeds, and Best Place to Treat Yourself in Leeds, and have received Tripadvisor Certificates of Excellence in 2016, 2017 and 2018. We are also extremely proud indeed to be ranked number one on TripAdvisor for Shopping in Leeds, which is a huge achievement as we are the only single shop and Independent business in the top five. It makes us do a happy dance whenever we think about it! The day always starts with a big cup of coffee for Claire, tea for Natalie. Natalie has her two girls to get ready and off to school. Claire has a clowder of cats to feed and fall over on the way out of the door…. Usually there will be errands to run on the way into the shop; banking, picking up supplies, dropping off parcels with the courier. Once we get to the shop the tunes go on and we’re ready to see what the day brings us! 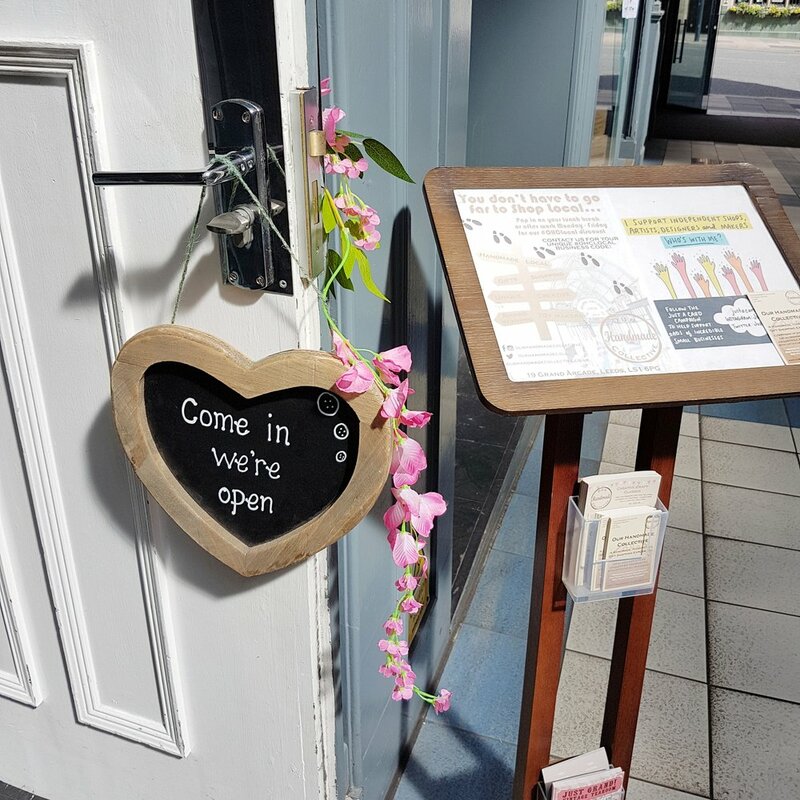 We’re lucky that we have amazing customers who love to pop in and see what’s new, and we have some lovely conversations every day. We have deliveries of stock every day, either Makers bringing stock in or couriers arriving with big boxes of treats to unpack. Then there are usually products to photograph, social media posts to prepare, enquiries to answer - all the usual day to day admin that forms part of running a business. More often than not there will be a craft project to complete, and we do move stock around regularly – we like to keep it fresh for our regular customers who visit often so they always spot something different! We are based in Leeds city centre, and our shop is based in the Grand Arcade, which is a lovely Victorian shopping arcade full of other independent businesses. It’s a great creative community. Our shop has been described as an Aladdin’s Cave of handmade treasures; there are gifts galore to see wherever you look! It’s an experience coming to visit us and having a browse along our (many) shelves. Being self employed and creative Makers, we do both suffer from the eternal problem of not switching off when we are not at work, and we don’t have a lot of spare time but what we do have is spent with our families and loved ones, enjoying some quality home life. The past couple of years have been our hardest to be honest. With everything which has been happening in the country in terms of politics and the ongoing Brexit negotiations, we are finding that the general public are being very careful about how and where they spend hard earned funds. With such large companies struggling, the closure of some big High Street names and an increasing trend of people buying online it all means that there can be less shoppers coming to visit, and those who do are probably spending a little less. Footfall has always been a challenge and we’re sure most retailers (large or small) will say they would like more customers! Our plan is to continue doing what we love; showcasing local Makers, supporting the local economy and providing a gift shopping experience for the discerning shopper who wants something out of the norm. We love what we do with a passion and we hope it shows in everything that we do. If we can continue making our customers and Makers happy then we’ll be happy too! Be ready to work really hard! Do your research, be as prepared as you can be for as many eventualities as possible – and ensure you have a support network around you, and fellow business owners to share ideas and information. The local community can a great resource of knowledge. Whether a retailer or a designer, try to offer something unique that will give you an edge and make you stand out from the crowd. Yes, as the meaning of the campaign is clearly explained in every article, interview and social media post. However, we have had conversations with fellow business owners and customers who have thought the campaign is about cards only (and one person said they thought JAC was a greetings card company!). In the uncertain economic times we are dealing with any support for small businesses is invaluable, and just knowing that other businesses are facing the same hardships and having the same conversations is reassuring in an odd way. Of course, we don’t wish for any businesses to be enduring tough times but it helps to know that it’s not localised, that it is factors beyond our own control and it is nothing that we have ‘done wrong’. Does that make sense? We’ve been following the campaign for almost 3 years now after seeing it on social media (a networking hour on Twitter). We use the main three social media platforms of Facebook, Instagram and Twitter. In terms of the general public, we hope that the majority of people might think twice before making a high street purchase and asking themselves if there is local independent business they can visit to buy that item. If they are looking for a gift for a loved one hopefully they’ll consider an Independent business – not only will they be helping the local economy but they will most likely also receive a higher level of customer service and a more tailored purchase (which could give them extra brownie points for effort and the thought which has gone into the gift!). When shopping online, sites such as Etsy where every business is a small, independent retailer are always a good choice to browse. There is a lot to be said for visiting local food/farmers markets for items such as fruit, vegetables and meat and for buying local produce – it is usually locally sourced and therefore supports even more of the local economy. As an example, here in Leeds city centre, there is a service within the local city market for food delivery. There will be a lot more schemes like this throughout the country which could be easily found with a little research. It’s all about changing perceptions; adjusting shopping habits slightly to consider using smaller businesses, thinking twice before going online to search for an item, buying your morning cup of coffee from a local independent coffee shop, ordering a book from a local bookshop instead of a large online retailer. People can mistakenly assume that buying from a local, smaller business will cost them more money, but as local retailers tend to use locally sourced suppliers without a lot of the high overheads and transportation costs, it’s often the case that it does actually save customers money. It also reduces the carbon footprint and is kinder to the environment! For ourselves, we feature the JAC campaign on our social media accounts and do a lot of shouting about it. We have our JAC window sticker, and we have a big stack of them to share with the local businesses around us – our aim is to have one in every shop window in the city! We also wear our JAC pins with pride. We chat to our customers to tell them about the campaign as well, and we have posters up in store. All our Makers are aware of the campaign. We advertise annually in a local publication showcasing Independent businesses across Leeds and we were asked to write an article to be included in the latest edition. Our article was all about the benefits of shopping small and shopping local, and of course we mentioned the Just A Card campaign as well! We support the work of 70 local Makers so the message to shop small and shop local is definitely not new to us, and is something that we mention without even thinking about it in pretty much everything we do!